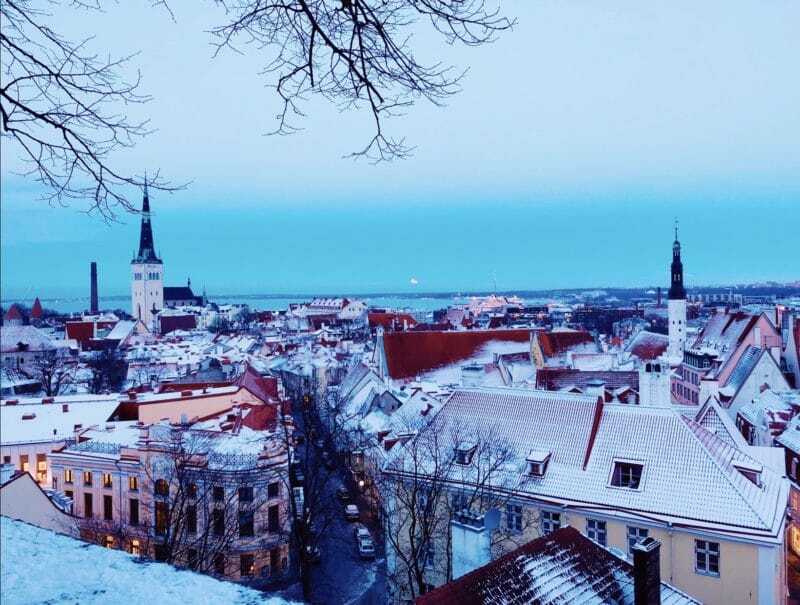 Whatever time of year you visit Tallinn, finding some of the best views should definitely be on your list of things to do. 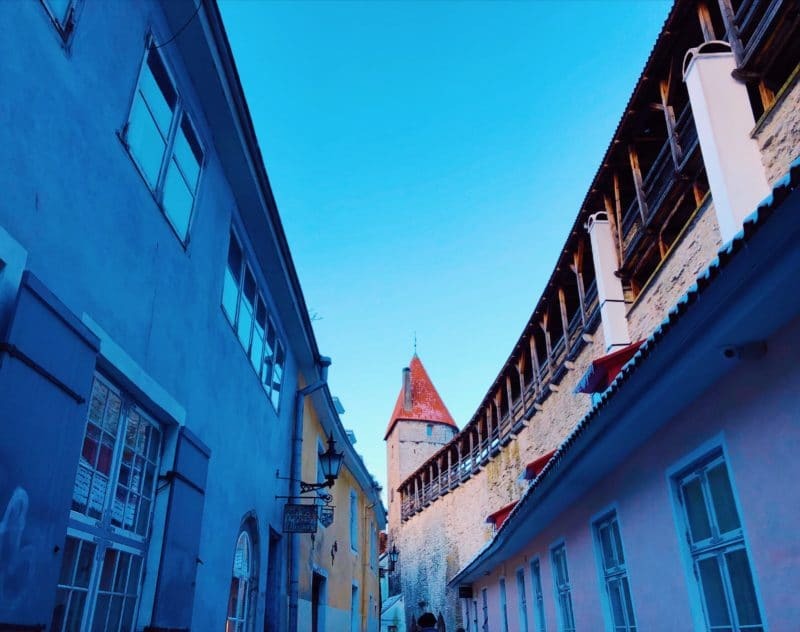 Walking through the Old Town to find them is almost as fun as the views when you get there, as you’ll wander through some of the most colourful and beautiful streets that you’ll ever see in Europe. 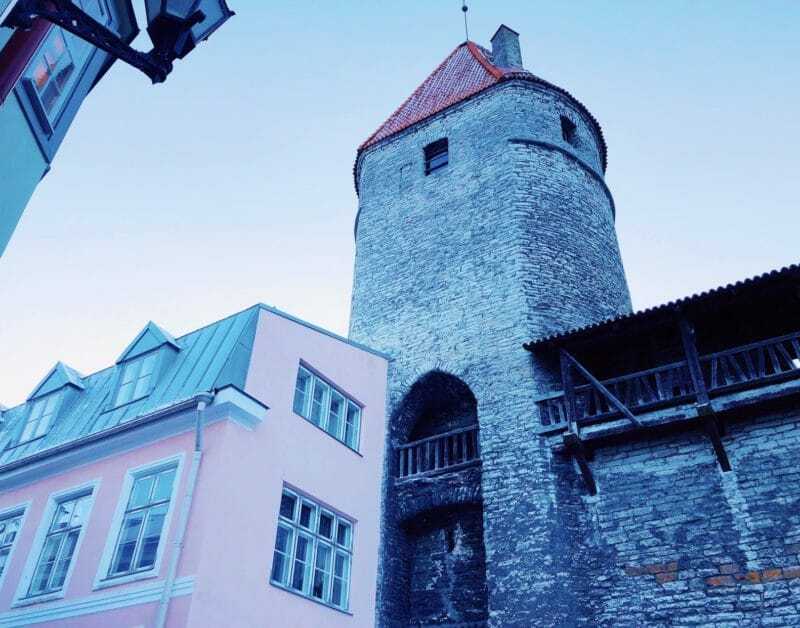 The city is almost begging you to admire it, with at least three official viewing platforms, and many other options for fabulous views of the Estonian capital. 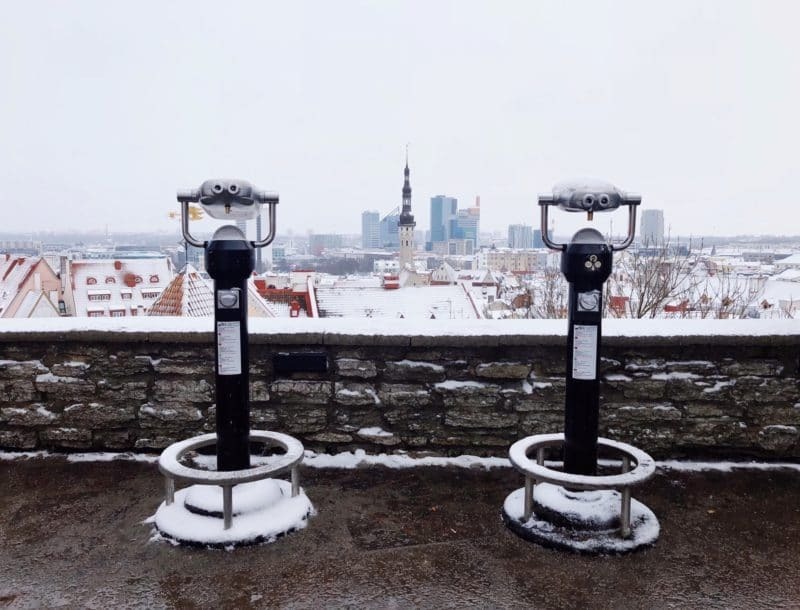 Here’s a few of my favourite spots for finding the best city views in Tallinn. 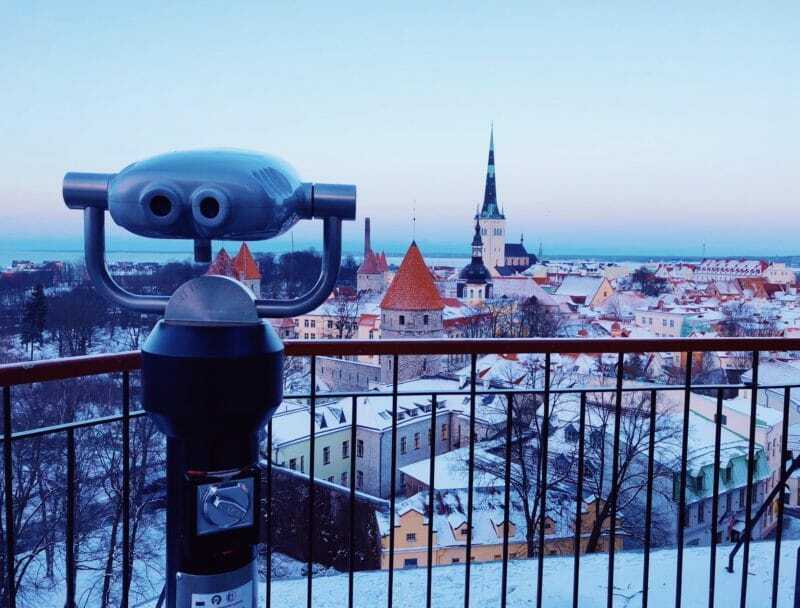 One of the most visited spots in Tallinn Old town, due to the famous wall art and incredible views of the old town red rooftops, is Kohtuotsa viewing platform. 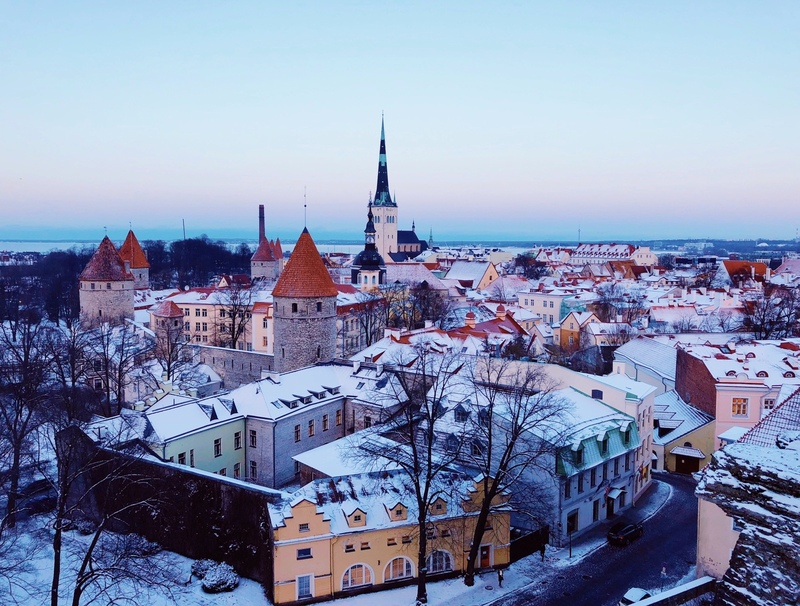 On a clear day you can see as far as the sea, with the glittering lights of the harbour circling around it, and as far as the more modern area of Tallinn in the distance behind the old town. 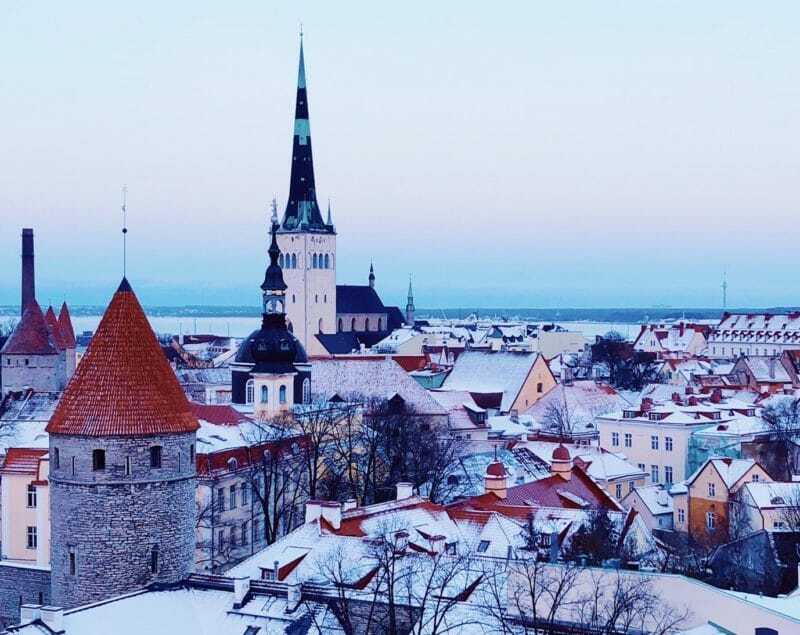 This point right at the top of Toompea Hill shows you just how close together the famous churches with their spires and steeples looming overhead are. 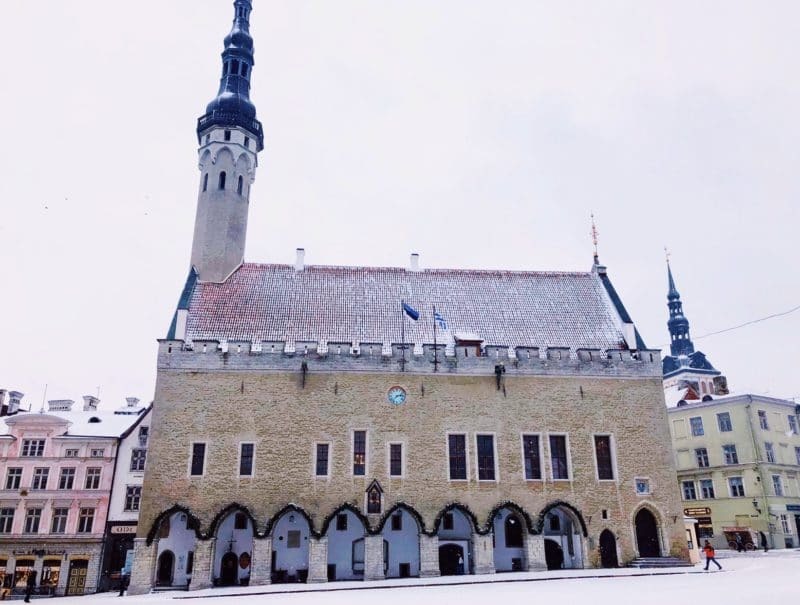 Toompea Hill was known as the power area of Tallinn, as all the embassies, government and banks are at the top of it overlooking the same view. A visit in the daylight allows you to see all these details, but an evening or twilight visit is really magical as the tiny windows glow yellow against the deep night sky. It almost doesn’t look real. 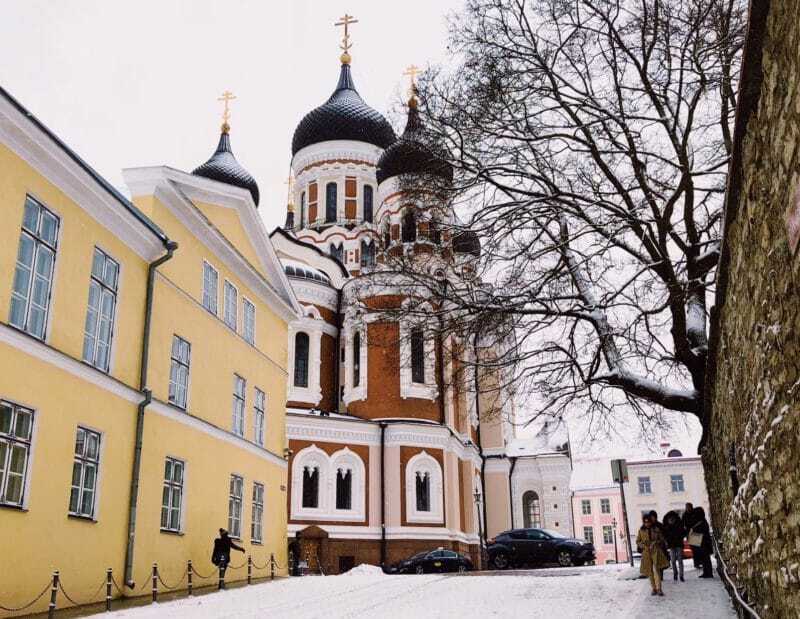 The walk to Kohtuotsa from the main market square won’t take you much longer than fifteen minutes at a slow pace, and it will be slow as you come across all the beautiful coloured buildings you’ll want to stop and admire on your way up, including the stunning Alexander Nevsky catherdral. The walk is uphill, along cobbled streets but isn’t too difficult. 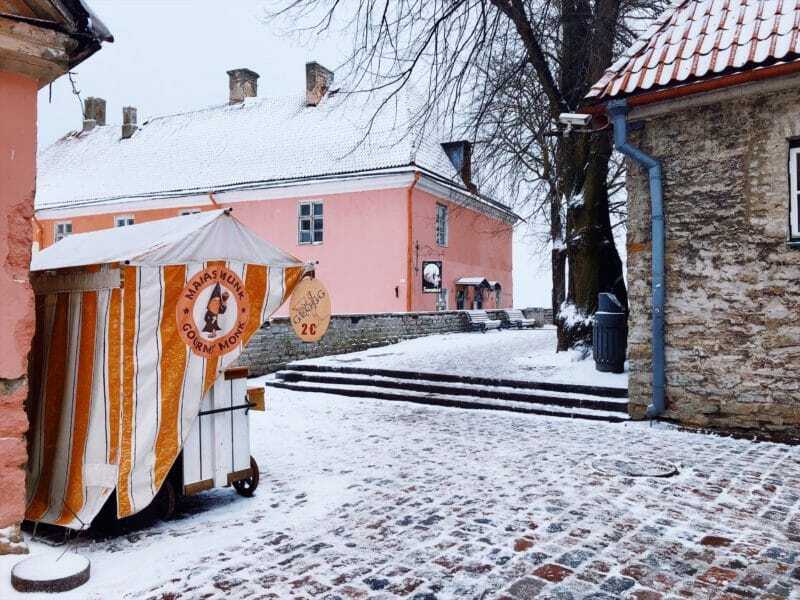 You know you’re heading in the right direction as the souvenir shops appear, and the old fashioned food carts can be seen selling roasted nuts and warm drinks. 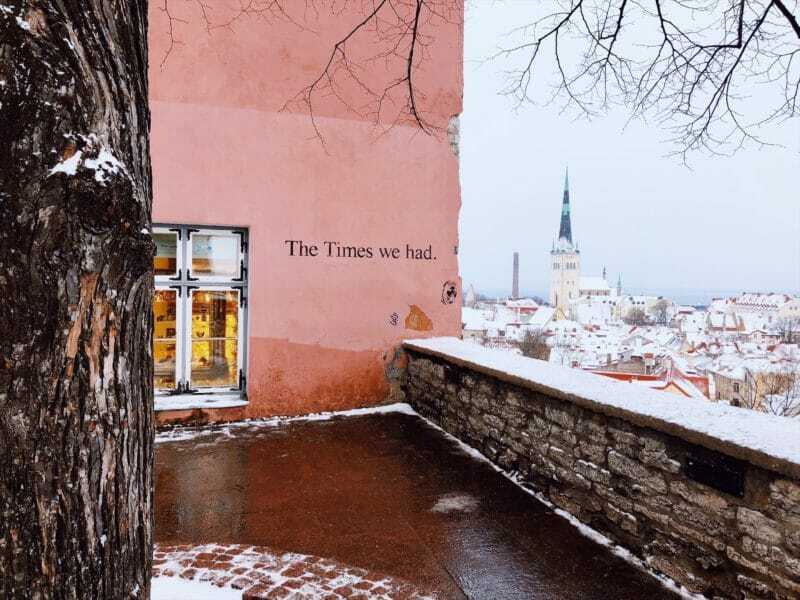 They say that the wall art ‘The Times We had…’ is one of the most photographed spots in Europe, certainly in Tallin, meaning something different to every person who reads it. You might also spot Steven the seagull, walking the wall – he’s famous for how friendly he is, just check out his hashtag on instagram. Of all the viewing platforms this one was probably my favourite, simply for how nice the walk to it was, and the breathtaking view of the whole city that stretches out in front of you. 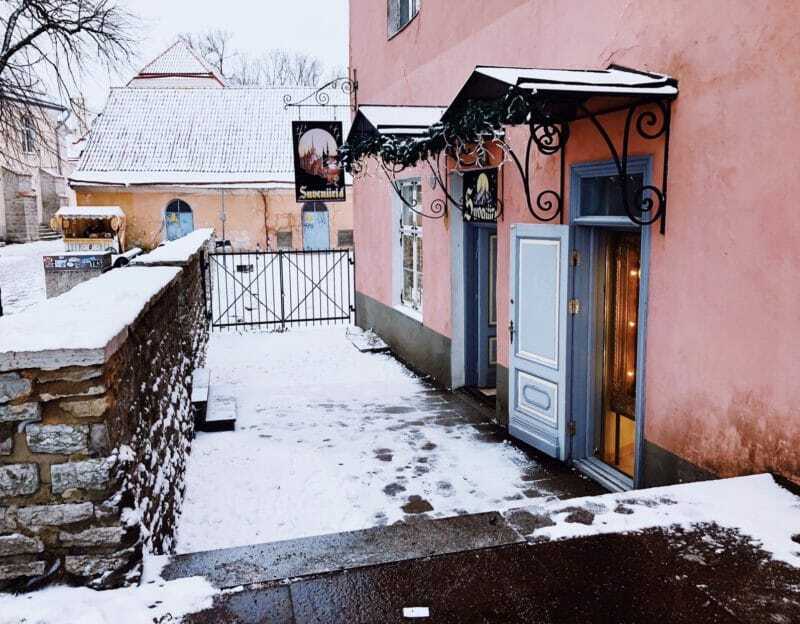 When I was there it was even prettier with a layer of snow, but in the summer dances are held on the platform and you can grab some refreshments at the open air cafe. 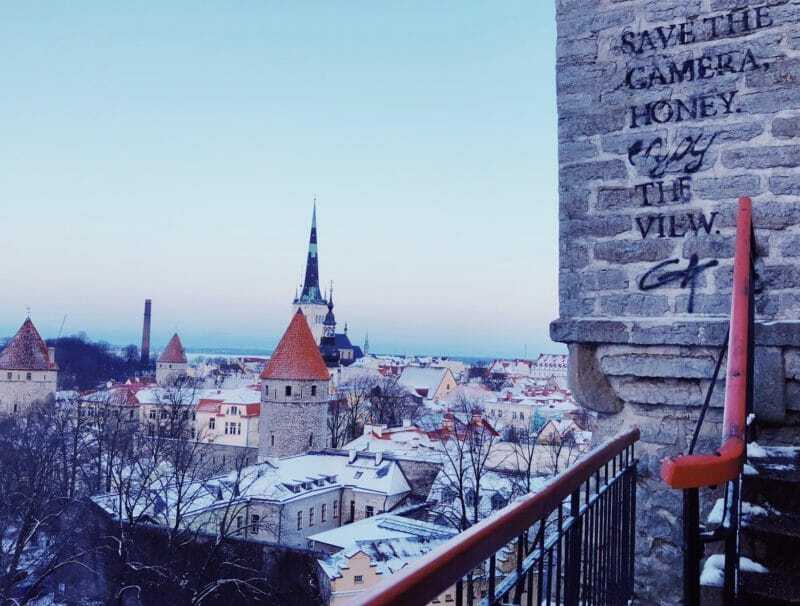 If you’re going to do any of the viewing platforms in Tallinn, make this the one. Another viewpoint that really shouldn’t be missed is Patkuli, and this one is actually located just outside of the old town. As you leave through the old city walls at Rahukohtu, the platform is signposted just across the road. The walk up to the top zig zags up the side of the hill. 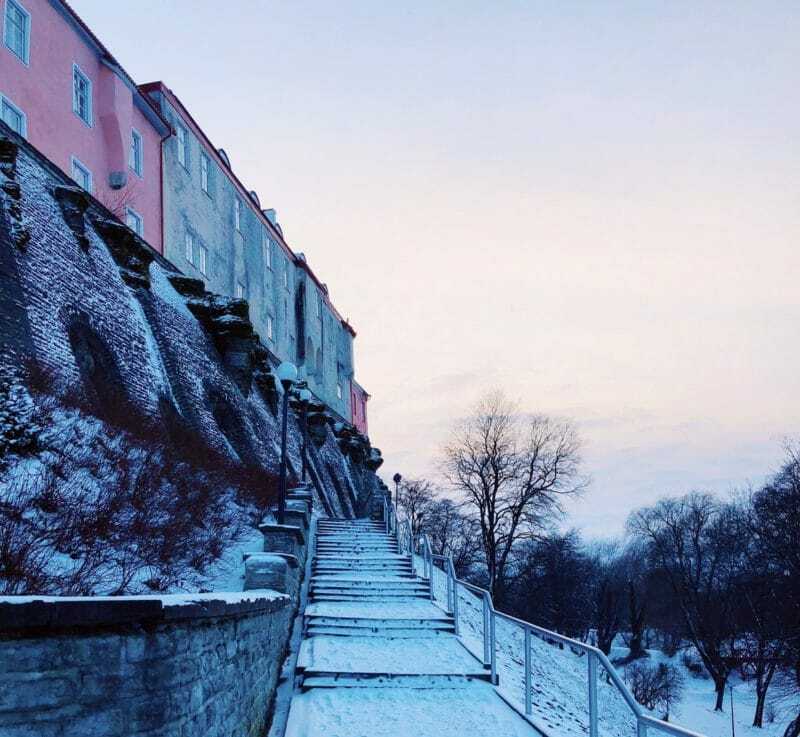 The hill is pretty steep but the path is fine, and there are railings and steps for the steeper bits – just be careful in the winter if its snowy! The higher up the hill the better the view becomes, giving you a perspective of the old town that shows St Olaf’s Church and a good stretch of the city walls curling around the town. As you get higher it’s really tempting to stop and take photos as you go, but pay attention to the sign and trust that the best view really is at the top. Again, visiting both during the day and in the evening is worth doing as it will give you the beautiful view in different lights. I came across this viewing platform by accident, as I walked a different way back down from Toompea Hill. Piiskopi viewing platform was originally the gardens of the Dome Church next to it, giving it’s name the Bishop’s Garden. The platform gives you a different view down Toompea Hill, and as it shows off less of the city it’s a lot quieter than Kohtuotsa or Patkulli. I found it quite eerie in the snow with the bishop statues, but apparently it’s a lovely sun trap in the summer where you can enjoy the gardens. I was really disappointed that I couldn’t climb up one of the old defense towers that are still in tact, to access the old town walls and walk along them. 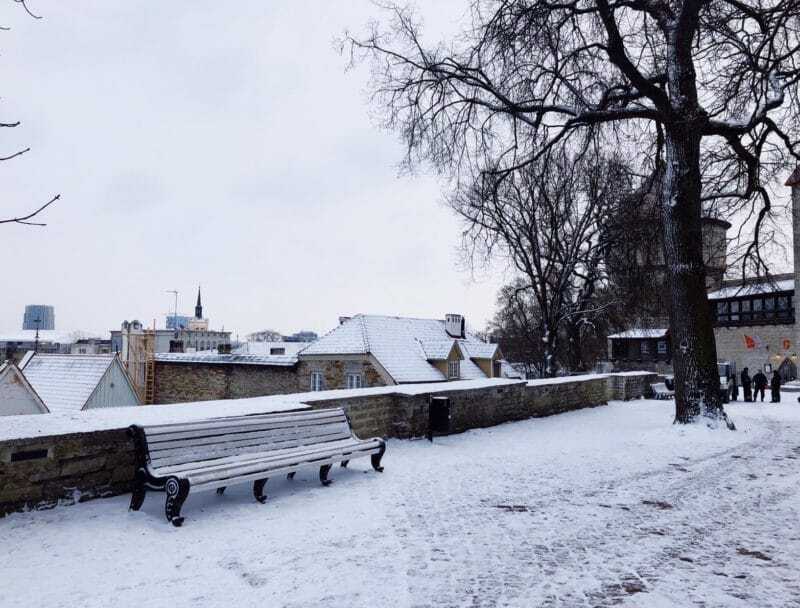 Some are closed in winter, so if you’re visiting check that you can get up there, but if you can they promise to show you views of the Old Town from all the way around. 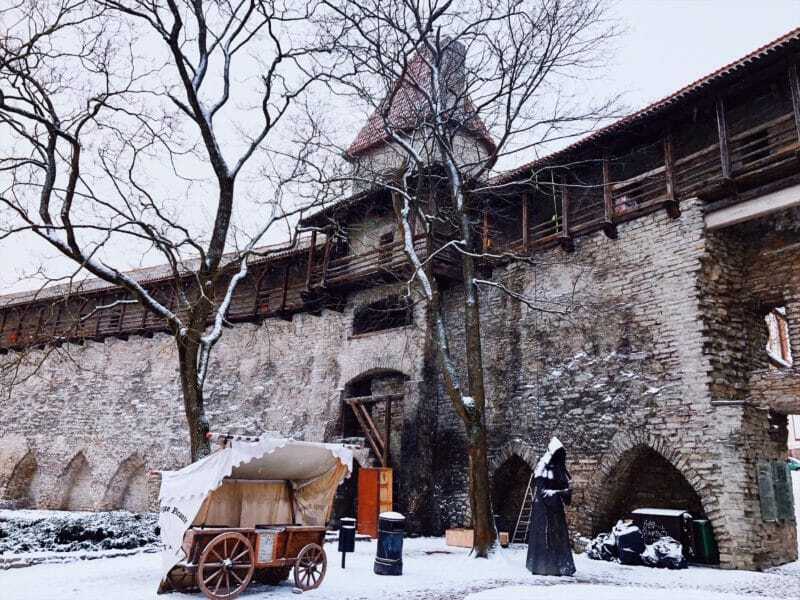 Kiek in de Kok is the most famous defense tower that forms part of the Tallinn City walls. The name comes from the height of the tower allowing the soldiers to see into the nearby kitchens below them. 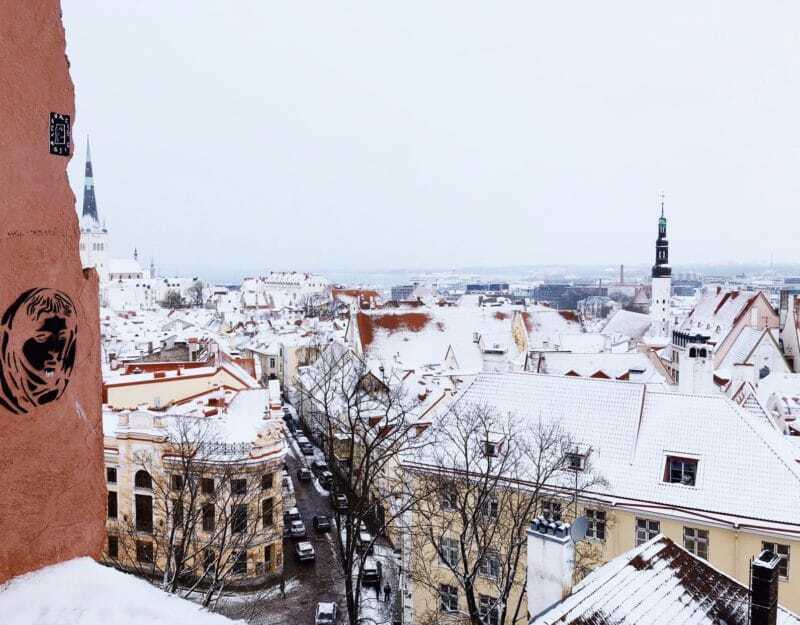 The town hall tower is only open to visitors in the summer months, July and August, but a climb to the top of the 15th century tower that is the oldest in the Baltics countries of Europe is sure to give stunning views over the square below and the wider city. Tickets aren’t expensive at 5 euros for an adult ticket and 2 euros for a child. Another one that is only open in the summer months, but St Olaf’s steeple was once the tallest building in the world, many many years ago. 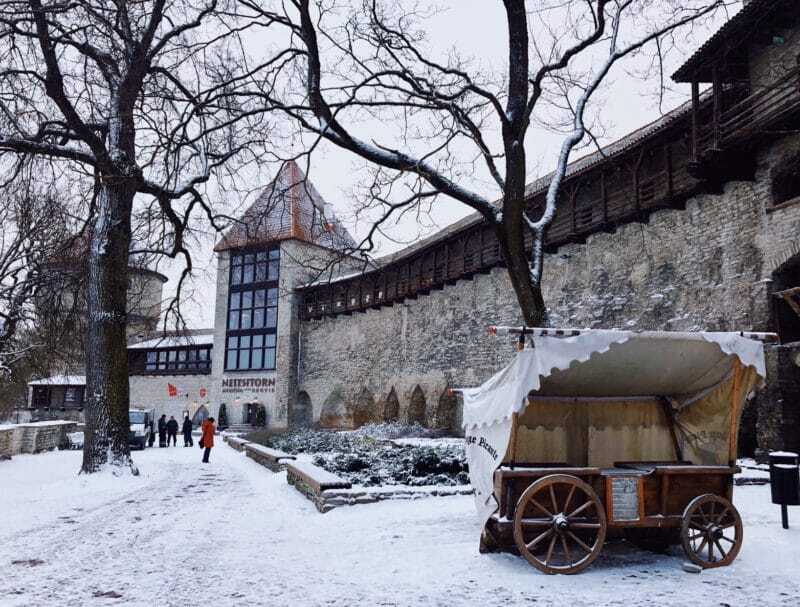 It is one of the most famous landmarks in Tallinn, and is very useful to spot if you ever feel lost. 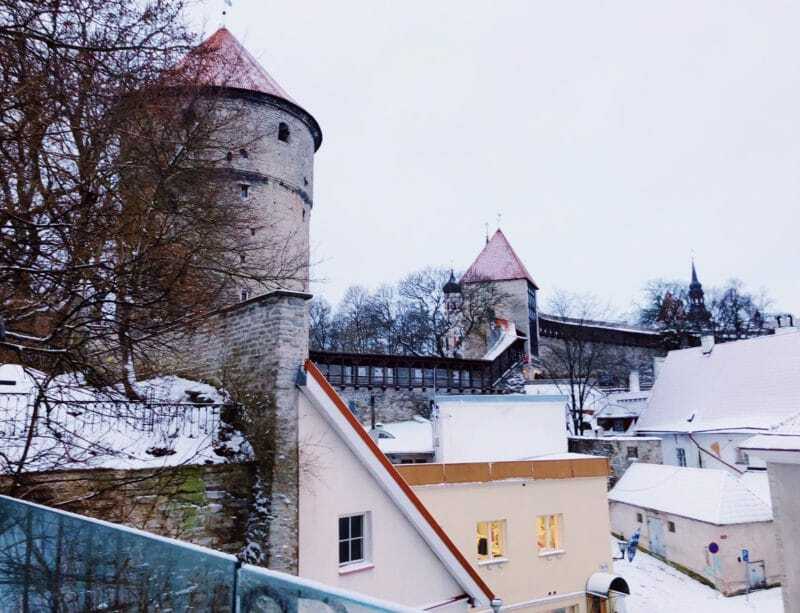 When it’s open, there is a 232 step climb to the top to the observation platform that gives views across the Old Town. 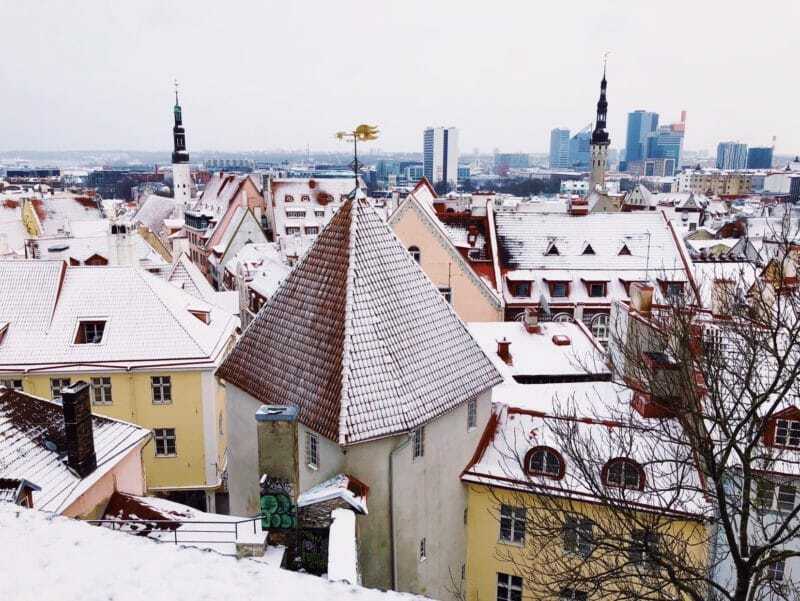 The only thing missing from the view that is so often seen in cityscapes of Tallinn will be St Olaf’s itself. If you fancy dinner with a view then I would definitely recommend Lounge 24 at the Raddison, just on the outskirts of the old town. 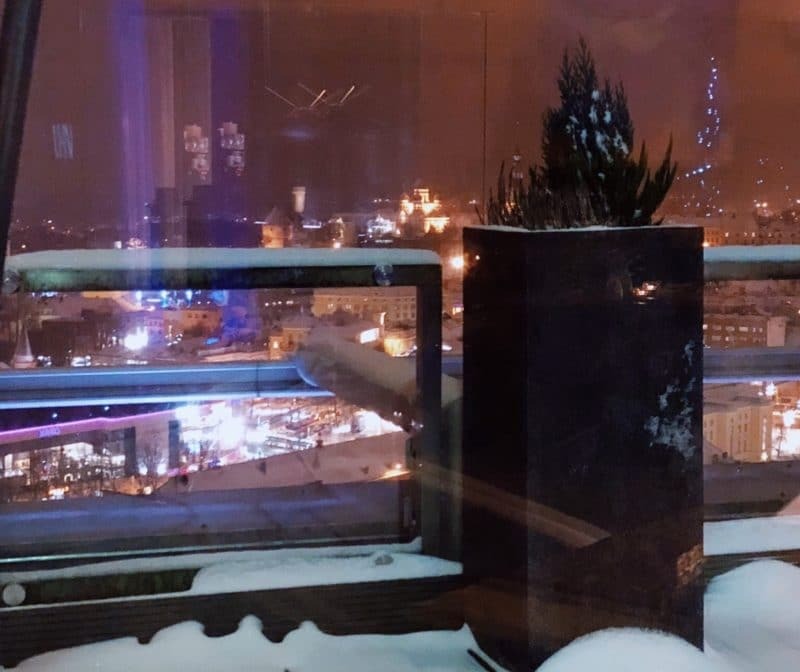 The Lounge 24 restaurant and bar give beautiful views over the city, and the Old Town. You can see the Alexander Nevsky Cathedral lit up, as well as up Toompea Hill and the recogniseable churches of the Lower Town. I couldn’t get a good photo from my dinner table due to the light reflecting, and it was far too cold to venture out onto the outside terrace. Definitely one to enjoy in the summer though! 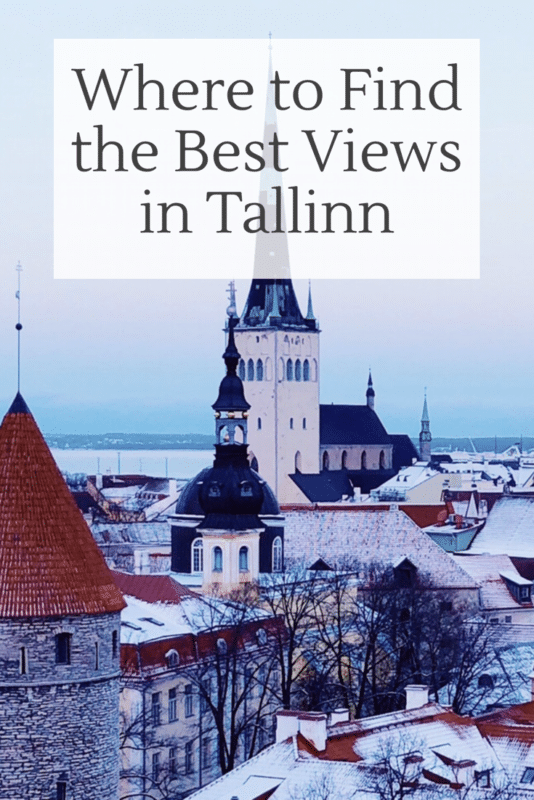 For a more detailed itinerary of how you can manage seeing all of these views, even if you’re only in Tallinn for a short period of time then take a look at my 24 hours in Tallinn guide.